I'd like to wish everyone a merry Christmas and happy holidays. I'd like to share a gift that I received the other day. One of the Cubs gave me a small gift and on the tag it read "Thanks for being a great Cub leader". That thought means a great deal to me. It means that people can make a difference by giving of themselves. So I would like to thank those who volunteer for good causes, do the right thing even when it is difficult, add humor to our lives, contribute acts of kindness and respect, and expect nothing in return other than for others to carry on and do the same. Everyone have a great 2008! A few people ask me about my cub leader name. Why Mang they ask? When I joined the 433rd, we had our Akela and our Bagheera. And since Baloo was taking some time off and might return, I had to find something that else that fit from the list of characters. In other packs, a common fourth was Kaa, Chil, Hathi, or even Rikki-Tikki-Tavi. And, I always liked a good party! Fall stargazing can be tough with all the overcast evenings we get. Tonight was one of those cool clear nights where the stars were brilliant and I was out for a walk. The first thing I saw was Orion low in the south east. Even through city light pollution it is magnificent. Cubs need to know five constellations as part of their astronomy badge. 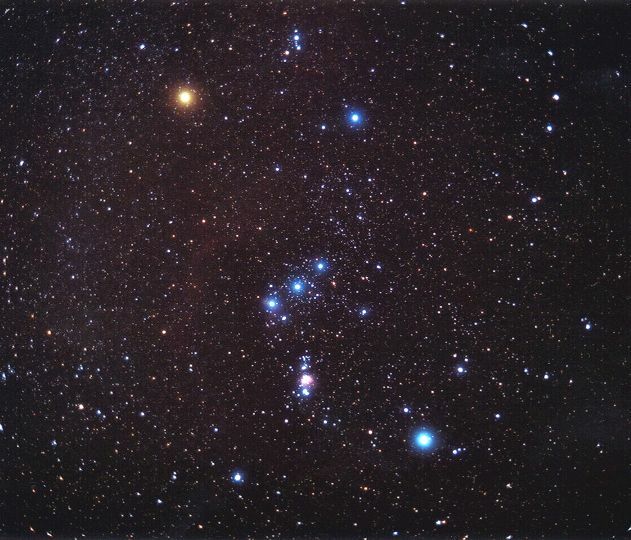 Orion is an excellent choice because it is easy to find, provides easy pointers to other constellations, and contains a number of interesting objects that are also part of the knowledge needed for the astronomy badge. 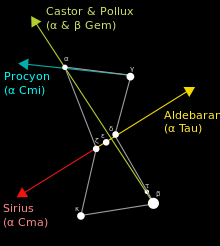 Orion's belt is a cluster of three stars running east to west that have been credited for the positioning of Giza's famous pyramids (this has been debunked see Wikipedia). Orion's left shoulder is Betelgeuse, a massive red giant that would swallow Earth and Mars if it replaced our Sun. It so big and the gases inside it so spread out that it has been called a red hot vacuum. It is also the first star, aside from our Sun, to have a picture taken showing anything more than a point of light! One day this star will explode in a supernova bright enough to be seen in daylight. Then it will fade away. Just below Orion's belt is a series of stars and nebula that are often referred to as Orion's sword. Among these is the great Orion Nebula a stellar nursery where new stars are being born.